BANGOR, Maine ― Communities throughout rural Maine are up against no shortage of challenges. Facing geographic isolation, aging and declining populations, paired with the loss of traditional manufacturing or mill jobs, it can be easy to feel pessimistic about the prospects of the state’s rural backbone. But pessimism was not the mood that filled a Cross Insurance Center conference room Friday, as a daylong discussion about the future of Maine’s rural economy stoked hope and advocated for a collaborative approach to revitalizing these rural communities. Woodruff was one of eight individuals recognized for their contributions as “sparkplugs” to rural communities at Friday’s discussion, Rural Maine’s Next Economy. The event, hosted by Envision Maine, attracted over 300 attendees that together represented nearly every sector that touches rural communities, including farming, forestry, education, broadband, energy and tourism. 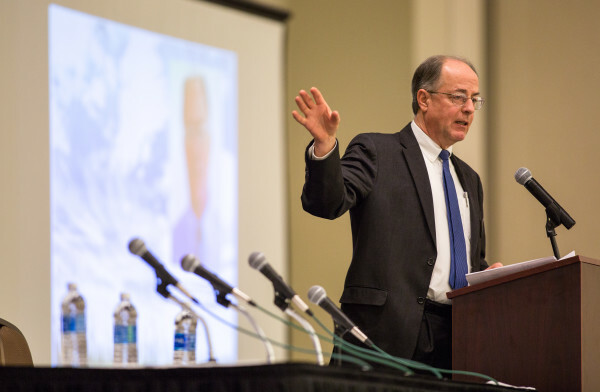 In his keynote address, Paul Costello, executive director of the Vermont Council on Rural Development, discussed how he has worked to assist in reviving rural Vermont communities but stressed that there is no one silver bullet to success. Additionally, he said that for progress to be substantive and lasting, the ideas for what a community’s future will look like need to come from the people who live there. The Vermont Council on Rural Development works with community members to set a list of priorities of what they envision the future of their community will look like. The council then works to gather these folks with individuals on the regional and state level to set an action plan and work toward actualizing their goals. At Friday’s discussion, Envision Maine recognized eight people who — through a business or organization ― have worked to bring relief or progress to rural communities across Maine. Recognized were Woodruff; broadband advocate Susan Corbett of Axiom Technologies; Amanda Beal, president of Maine Farmland Trust; champion behind the Katahdin Woods and Waters National Monument, Lucas St. Clair of Elliotsville Plantation Inc.; hunting and fishing activist George Smith; Bonnie Runkin, coordinator of Slow Money Maine; Leah Cook of Crown of Maine; and Nancy Smith, executive director of GrowSmart Maine. In his remarks, St. Clair reiterated Costello’s point that there is no one solution to solving the issues facing rural communities, but rather a combination of an array of Maine’s assets, whether it’s farming or fishing or broadband or tourism. “We have to recognize that there is great potential in rural Maine,” St. Clair said. Maine’s potential across a number of industries was the topic of workshop sessions throughout the day. Small-scale agriculture as component in rural economies was the topic of one such session. Farmers Simon Frost of Thirty Acre Farm, Carly Delsignore of Tide Mill Farm and Nicolas Lindholm of Blue Hill Berry Co. discussed how they started their farm and what adaptations they have made to their farm plans to remain profitable. Frost began farming as a homesteader in Whitefield, but upon realizing that he could raise more money to support his family by expanding to value added products, his farm’s main product has become lacto-fermented vegetables such as sauerkraut and kimchi. He has found success in this model and now sells his jarred products across the state, and south toward Boston. This kind of adaptive spirit also helped Lindholm who began his organic blueberry farm solely as fresh pack and direct to consumer. Within the last five years he and his wife have expanded their product line to include frozen blueberries, which they now ship across the country. While there are numerous ways farmers can reach markets outside of Maine, as Frost and Lindholm have done, Delsignore said in order for Maine farmers to prosper, first and foremost, Maine consumers need to collectively choose local products over food sourced from out of state. “It would help for people to take a personal investment in making that choice on a regular basis to buy that Maine food,” Delsignore said. An afternoon workshop focusing on how organizations have brought broadband capabilities to rural communities echoed Costello’s earlier point that progress needs to include community engagement. Page Clason, member of the Broadband Committee for the town of Isleboro, recalled that when the committee was workshopping the options for bringing broadband to the island community, they needed to work to engage people in discussions, to ensure this was a decision being made collectively by the community. Regardless of the strategy taken to chart a prosperous future for Maine’s rural economy, those in attendance at Friday’s event were in agreement that the foundation for a positive rural economy is there.